That’s my lap as I fly from Oxnard (OXR) back to Santa Monica (SMO). I took off through a thin layer of clouds. On my right knee is my miniZ kneeboard (from ZuluWorks), where I have copied my clearance and I have the Hobbs time and ATIS written down. Little pilot notes. On my left knee is the book of approaches into various airports, open to the VOR-A (alpha) approach into Santa Monica. 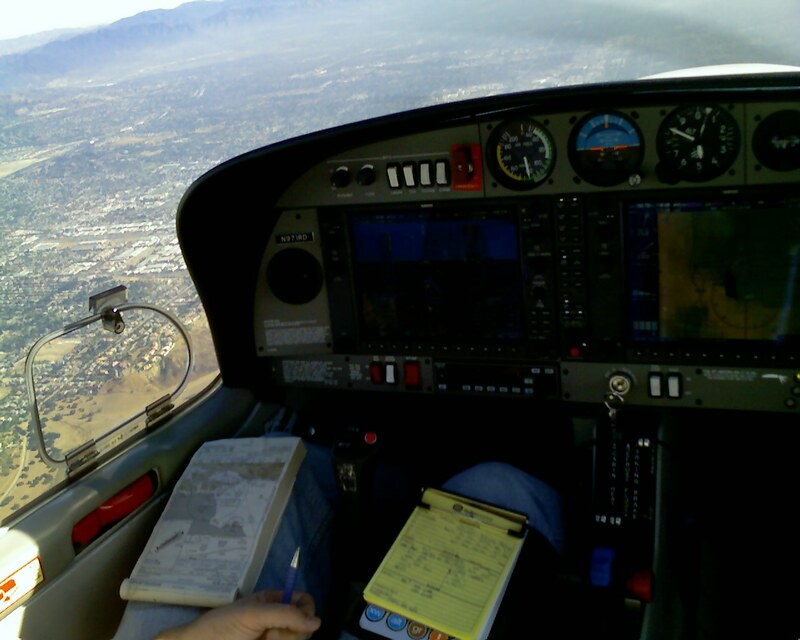 I am nearing the Van Nuys VOR, and soon I will turn toward DARTS, my initial fix on the instrument approach. A year ago we were very happy to fly up in a rented Piper to Fresno so that we could drive into Yosemite and eat Turkey with the LaZebniks (the boys’ cousins). This year we’ll just be at the LaZebniks’ house instead, so we have planned a trip up to Sonoma for the following day. 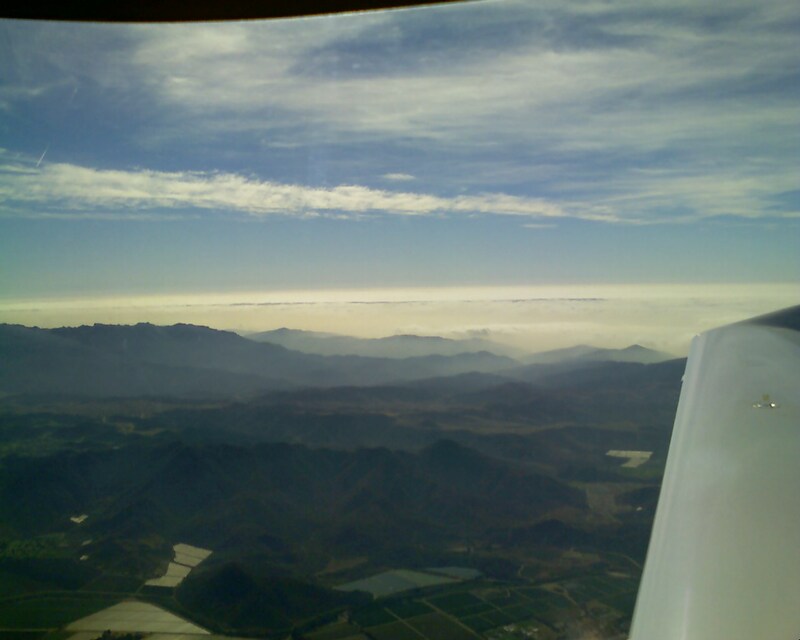 I am legally current and certificated to fly us through clouds, but I am doing some more work each day before the flight so that I am not just current, but comfortable and proficient. I finished one DVD course on my computer and I am two thirds of the way through another. They are specific to our avionics (airplane electronics) and have both provided some good tips and tricks. I’ll be flying each day before we go so that I am very comfortable with the plane and the procedures on Friday when we head up. I wanted to fly as I expect to be flying on Friday, which is by delegating the en-route flying duties to Otto, the autopilot. The trip becomes more of a management of systems and less of a flying task involving the stick and rudder. It is less visceral (I can’t feel a change in wind affect the plane), but it is steadier and more predictable. On Monday I flew with my friend Art. I forgot to put in the LAX VOR before taking off (I know on the map where the 315 radial is, so I was surprised it wasn’t sweeping in; I just turned where I needed to for my next heading). The ILS into OXR is a little confusing on the page compared to the G1000. I switched to the tower a little early. Flying Tuesday I corrected those errors and wound up staying a little high instead of descending on the glideslope, because I was trying to locate the outer marker on the approach chart and compare it the G1000. My flight from Oxnard returning to SMO by myself was perfect. I spotted every plane they pointed out as traffic. I flew every heading and altitude perfectly (in part because I was putting them into the autopilot, say hello Otto), and flew the approach flawlessly. Tomorrow I will go up in the morning with Art and fly a hold, which is a little racetrack in the sky that instrument pilots fly when they need to wait somewhere, or need to descend in place. and look back over the Santa Monica mountains to the blanket of clouds covering my neighborhood, airport, and usual haunts. A few months ago that would have been a paralyzing sight, since it meant a change of plans (landing in Van Nuys, most likely), and a disruption. Now, it is just a beautiful view of the sun reflecting off of the clouds and the mountains coming up through them.